Fans will finally be able to bring home the box office blockbuster Star Wars: The Force Awakens on Digital HD and Disney Movies Anywhere April 1, with the Blu-ray and DVD arriving April 5. We've already seen a few sneak peeks from the bonus content so far, and today we have another glimpse at the special features, courtesy of Buzzfeed, which has debuted a new video showcasing Daisy Ridley's Rey. Director J.J. Abrams discusses how the young actress was perfect for the role, while we also get to see parts of her audition tape. It has been common practice over the past few years for actors to audition with lines that aren't even part of the actual script itself. 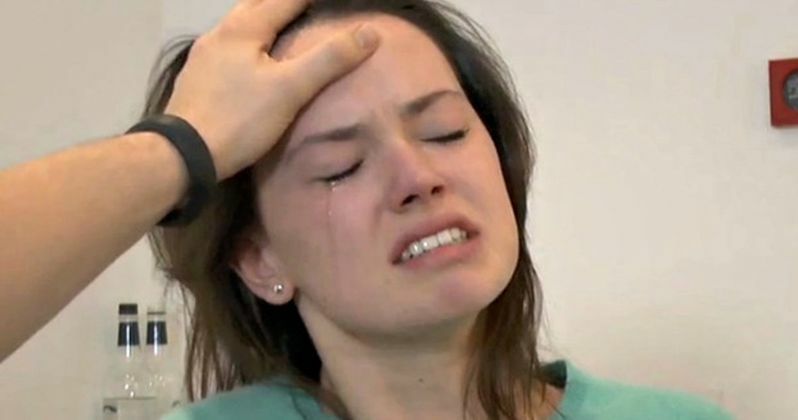 That wasn't the case with Star Wars: The Force Awakens, with this audition tape revealing that Daisy Ridley actually read the now-iconic scene where Kylo Ren tries to read her thoughts. This video also gives us brief glimpses at concept art drawn for the character, before Daisy Ridley was cast, with J.J. Abrams admitting that they had found a lot of great people, but Daisy Ridley was the only one he thought could pull off everything he was asking for, after she gave an incredible audition. This bonus features excerpt is part of the feature length documentary entitled Secrets of the Force Awakens: A Cinematic Journey. For the first time, discover the complete story behind the making of The Force Awakens, revealed through in-depth footage and exclusive interviews with the actors and filmmakers in this feature documentary. The film actually debuted at the SXSW Film Festival earlier this month before arriving on Blu-ray and DVD. Star Wars: The Force Awakens saw the eagerly anticipated reteaming of original Star Wars stars Harrison Ford, Carrie Fisher and Mark Hamill, along with Anthony Daniels, the only actor to have been in all seven Star Wars films, and Peter Mayhew. The returning cast was joined by newcomer Daisy Ridley, who beat out fierce competition to take the principal role of Rey; BAFTA Rising Star Award winner John Boyega (Attack the Block, Imperial Dreams) as reluctant stormtrooper Finn; Emmy nominee Adam Driver (Lincoln, Girls) as the villainous Kylo Ren, and Golden Globe winner Oscar Isaac (Inside Llewyn Davis, The Bourne Legacy) as Resistance pilot Poe Dameron. Star Wars: The Force Awakens was directed by J.J. Abrams and written by Lawrence Kasdan & J.J. Abrams and Michael Arndt. Lucasfilm president and eight-time Academy Award nominee Kathleen Kennedy and J.J. Abrams, along with his longtime producing partner Bryan Burk, are the film's producers. Having established a musical legacy with his iconic scores for the previous six films in the Star Wars Saga, acclaimed composer John Williams returned to score Star Wars: The Force Awakens, ultimately garnering his 50th Oscar nomination for it. Take a look at Daisy Ridley's audition for Star Wars: The Force Awakens, and stay tuned for more on the Digital HD, Blu-ray and DVD release.